The Yellow-headed Amazon (Amazona oratrix Ridgway, 1887), parrot afferent to the order of the Psittaciforms (Psittaciformes), family of the Psittacids (Psittacidae), genus Amazon (Amazona), endemic to the Neo-tropical bio-geographic area, reaches the apex of the taxonomical complexity and of the relevant debate done by the International Commission for Zoological Nomenclature (ICZN) and by the Birdlife Society. It is called in German Gelbstirnamazone, in French, Amazone à front jaune, in Spanish, Amazona real and in Italian, Amazzone testagialla. More precisely, the species Amazona oratrix, after many taxonomical biologists, conducts to the species Amazona ochrocephala 1788, in its turn categorized in three separate species, one of which is rightly the Amazona oratrix. This last species is subdivided, in its turn, in the subspecies Amazona oratrix oratrix, Amazona oratrix tresmariae, Amazona oratrix belizensis and Amazona oratrix magna. The other two species, much similar, are the Amazona ochrocephala, subdivided in the subspecies Amazona ochrocephala ochrocephala, Amazona ochrocephala panamensis and Amazona ochrocephala xantholaema and the Amazona ochrocephala nattereri. Finally, the species Amazona auropalliata concludes the complicated categorization, subdividing in its turn in three subspecies: the Amazona auropalliata auropalliata, the Amazona auropalliata caribaea, and the Amazona auropalliata parvipes. The variability of the populations inside Central America is so high that, after some ornithological biologists such categorization might not be justified. For instance, birds at home in north-western Honduras, are at times described by the ornithologists as the subspecies Amazona oratrix hondurensis, whilst those of eastern Guatemala, as the subspecies Amazona oratrix guatemalensis. But no all are in agreement with these last two classifications. Finally, the subspecies Amazona oratrix magna is not recognized by some authoritative ornithological biologists. Often, the subspecies Amazona oratrix magna is also mistaken with the Amazona oratrix tresmariae, even if the first may be differentiated from the second, by experienced eyes, for the presence of a darker border on the chest and a greener plumage of the abdomen. All mentioned species and subspecies are afferent to the Appendix I of the Washington Convention, 1975 (Convention CITES), and therefore cannot be commercialized. The IUCN classifies them as highly endangered species and subspecies. 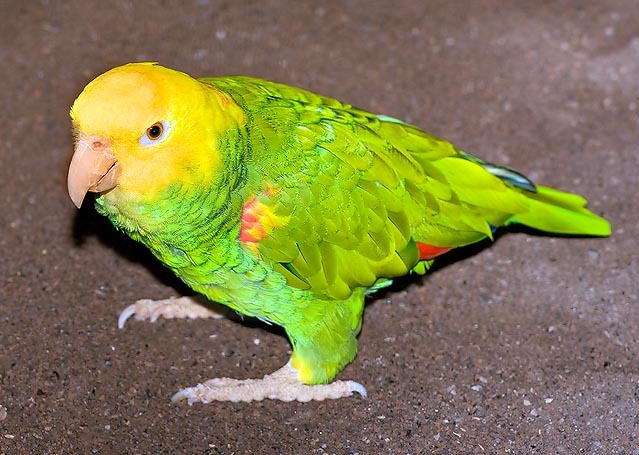 The subspecies Amazona oratrix oratrix in German is called Doppelgelbkopfamazone, in English and Spanish it keeps the same common names of the nominal species. The subspecies Amazona oratrix tresmariea in German is called Tres Marias Amazone, the other common names are equivalent to those of the nominal species. The Amazone oratrix belizensis has equivalent common names in English, Spanish and Italian, but in German is called Gelbkopfamazone. And, finally, also in the subspecies Amazona oratrix magna only the German common name is different, being Grosse Gelbkopfamazone. The nominal species Amazona oratrix and the subspecies Amazona oratrix oratrix are present un Mexico, along the coasts of the Gulf of Mexico, of the Pacific Ocean and close to the volcanic complex Fuego de Colima, 3857 m high, afferent to the “Mexican Volcanic Belt”. A 900 km belt, where do concentrate all Mexican volcanoes, going from the city of Veracruz (capital of the state of Veracruz) up to the Pacific Ocean. They are also localized in the western part of the state of Michoacán and the state of Guerrero. The subspecies Amazona oratrix tresmariae is localized in the Mexican islands Las Tres Marias and in the bay of San Juanico in the Sea of Cortez close to the Baja California. The subspecies Amazona oratix belizensis is present in the inland of Belize (former British Honduras). And finally, the subspecies Amazona oratrix magna is present in the Caribbean Gulf of Mexico, more precisely in the southern part of the state of Nuevo Léon, of the Free and Sovereign state of Tamaulipas and of the state of Veracruz, up to east of the Free and Sovereign state of Oaxaca and the Free and Sovereign state of Tabasco. The Amazona oratrix, and all the subspecies in which it subdivides in the various geographical areas, colonizes all sort of land planted with trees, both dry areas as well as the humid ones of the tropical and subtropical zones, up to 750 m of altitude above the sea level. They live well also in the South American savannahs and in the grassy and bushy zones, composed by shrub plants even 2-3 metres tall. In the forest zones, they prefer to live in the boundary areas. They are frequent visitors to the cultivated areas and of the coffee plantations, near the villages. The livery of the nominal species Amazona oratrix, resembles much to that of the Amazona ochrocephala and of the subspecies Amazona ochrocephala ochrocephala, even if the colours of the first one are brighter. The green is the dominant colour of the plumage, and the feathers of the nape are slightly bordered of black. The front, the upper part of the head and occasionally the area around the neck have a nice intense yellow. The belt marking the wings is red; the edge of these ones is, on the contrary, yellowish-green. The tips of primary and secondary coverts form a violet-blue pattern. The tail is green with the extremities of the rectrices greenish-yellow. They are red at the base. A blue pattern is present in the outer part of the tail. The periophthalmic skin is whitish, the pupil is grey, with red facets, the iris is orange and the zygodactylous feet are grey. The beak has some orange streaks on the upper branch. There is a total absence of sexual dimorphism, either transitory or permanent, in both sexes. They are about 34 cm long birds, per a weight of about 380-400 g and with a wingspan of 19,8-22,2 cm. The Amazona oratrix oratrix Ridgway, 1887, has generally an equivalent livery, even if in this subspecies we note that the yellow of the head extends up to the throat and to the initial part of the back. 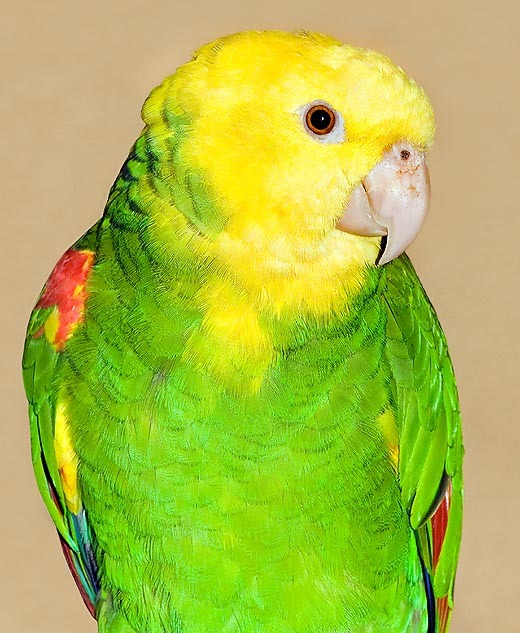 The feathers of the nape are green, with marked black outlines, often mixed with yellow feathers, and, in few specimens, also with red outlined feathers. Here we observe a small dimorphic character among the sexes, even if an experienced eye is necessary for seeing it. In fact, the yellow of the males is usually more extended than in the females. In both sexes, the chest and the abdomen are green and virtually all specimens have the feathers with darker colourings than the nominal species. The inner part of the thighs is yellow; the belt marking the wings is red with a mix of yellow feathers. The immature pullets have a darker iris; the yellow is limited only to the upper portion of the head and to the front, whilst the belt marking the wings is green. They are 38 cm long birds, weighing 400 g and having a wingspan of 20,5-23,5 cm. The Amazona oratrix belizensis Monroe e Howell,1966 also has a livery equivalent, in general, to the nominal species, with the following differences: the yellow of the head extends to the area of the eyes, to the cheeks and to the feathers covering the ears. At times, the yellow may be found, in small irregular dots, up to the rear of the neck and the throat. The belt marking the wings may be, in some individuals, stained of orange-red; the throat and the abdomen have a slight blue colouring. The pupil may have various colourations, red, grey, brown, orange, etc. The immature pullets have a darker iris and pupil, and the yellow keeps confined only to the front and the upper part of the head. In this subspecies there is no sign of sexual dimorphism; They may reach the 36 cm, with a weight of about 380-400 g and a wingspan of 20,5-22,5 cm. Also the subspecies Amazona oratrix tresmariae Nelson,1900, as in general line the previous ones, is equivalent to that of the nominal species. The differences consist in a slightly paler yellow, extended from the head to the back, in some specimens also to the chest (but much less extended than in the subspecies Amazona oratrix magna). The feathers of the nape are not marked in black at the edges, are often mixed with yellow feathers and, in some males, also with feathers bordered of red. The chest and the abdomen are green, marked with very bright blue tinges and in all specimens of this subspecies the black border of the feathers is absent. The thighs are yellow internally, in some cases this colouring is however absent. A narrow red band mixed with yellow marks the wings. The parrots of this race are broader, longer and more robust than those of the nominal species and of the other species described before. They measure 40 cm, weigh 450-500 g and have a wingspan of 22,5-24,5 cm. There is absence of sexual dimorphism. The pullets have a dark iris; the yellow is limited to the front and to the upper part of the head. Finally, the subspecies Amazona oratrix magna Monroe and Howell,1966 has always a livery which is mainly analogous to the nominal species. The differences stand in the variability of the extension of the yellow colour to the chest and the nape. The feathers of the nape are, in some specimens, bordered of red, the rest of the feathers of the chest and the abdomen are green and theoretically, in all individuals, they are bordered of black. The thighs are completely yellow, the belt marking the wings is much extended and substantially mixed with the yellow; they are larger than in the nominal species. The pullets have a darker iris; the yellow is limited to the front and the upper part of the head. The belt marking the wings is green. They are 40 cm long, with a wingspan of 22,0-24,5 cm. There is sexual dimorphism. The nominal species and the subspecies as well, tend to have equivalent life habits in their geographic areas. They live either in stable pairs or in small groups of some tens of members, or, finally, in ephemeral aggregations of even 250 individuals. They are quite numerous when they fly of they huddle on the same tree in the resting locations. They prefer the tall trees standing along the water streams, where they remain, silent, during the rest and hidden among the canopies, in the shade, during the warmest hours of the day. They are regularly in flight since early morning, and bathe in the waters of the nearby rivers or water streams. They keep silent also when eating, on the contrary, during their raids in the cultivated fields, maybe due to the joy or for attracting the companions. They love climbing the trunks of the trees, rather than flying from branch to branch. Their flight is in straight line, characterized by powerful wing beats and may reach high altitudes. They perform local seasonal migrations, always related to the availability of food. Their cry is noisy, harsh and metallic. 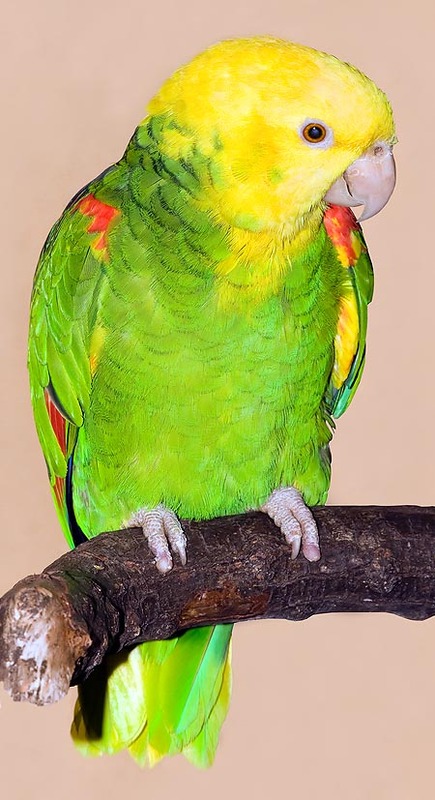 All these parrots have the same alimentary ecology: they nourish of fruits, seeds, nuts and flowers, berries and buds of the genera: Pithecellobium, Acacia, Macuna, Zuelania, Bumelia, Solanum, Tabebuia, Erythrina, Ficus, Cochlospermum, Curatella, Teminalia, Euterpe and various species of palms. They visit, on a daily basis, the “barreiros”, particular areas, on the banks of the rivers, where the soil is very rich in mineral substances. The ephemeral flocks nourish also in the plantations of bananas, cedars, avocadoes, and in the fields tilled with alfalfa, maize and various cereals. The mating time varies in function of the geographic area to which they belong. Considering the species in the wild and those in captivity, in Central America we go from February and June, in Venezuela from April and July, In Surinam and in Colombia, from December to January, in Brazil from June to October. In the Las Tres Marias Islands in February, in Trinidad, in March. The male takes care of the construction of the nest, which is placed at the top, on palms or trees, even if dead, up to 10-12 m above the ground. In some cases, the nests are built even inside the termite mounds. The female lays 2 to 4 eggs, which measure 3,74-2,91 cm. The incubation lasts, as an average, 25-26 days, and the born pullets are nourished for two months after the birth, and then will fly away. During the hatching, the male takes care of the sustenance of the female which does not get away from the nest, but lives and sleeps, also during this period, in the collective rest areas with the con-specifics, remaining far away from the nest which it will reach only for carrying the food to the partner. → For general information about Psittaciformes please click here. → To appreciate the biodiversity within PSITTACIFORMES please click here.